Mississippi State head coach Dan Mullen knows a thing or two about developing and grooming gifted dual-threat quarterbacks and turning them into stars. During his short stint as Utah’s quarterback coach, Mullen played an instrumental role in transforming Alex Smith from an unheralded 2-star recruit into the No. 1 overall pick of the 2005 NFL draft. A few years later, with the assistance of his long-time mentor Urban Meyer, Mullen managed to work his magic yet again at Florida, where he helped harness Tim Tebow’s unique physical gifts and turn him into a Heisman winner and one of the most legendary figures in college football history. Unfortunately, since moving from Gainesville to Starkville after the 2008 season, the spread offensive guru hasn’t had the benefit of working with a signal-caller anywhere near the caliber of either Smith or Tebow. The absence of a dynamic playmaker behind center is the main reason why Mullen’s spread offense has failed to truly take flight and it’s why the Bulldogs have gone just 16-24 in SEC play during the past five seasons. After a rather forgettable and lackluster 7-6 campaign last fall, Mullen knows that 2014 is shaping up to be a crucial season for the direction of his program. Luckily, the coach finally seems to have found a quarterback who is capable of turning Mississippi State into a viable threat in the SEC. Dak Prescott is a versatile dual-threat quarterback who has the skill-set to flourish as the centerpiece of Mullen’s offensive system. He’s the dangerous and dynamic playmaker that the coach has been waiting for since he first arrived in Starkville. 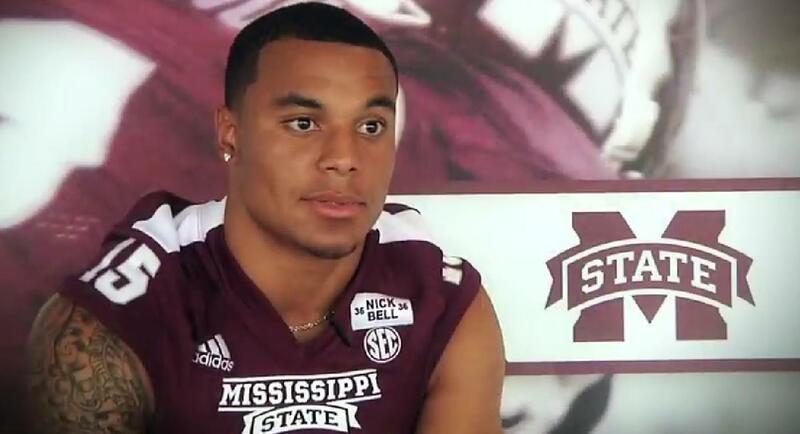 Prescott thrived in his first year as a starter in 2013, showing plenty of intriguing flashes of his physical ability, which left the Bulldog faithful buzzing about his potential. The 6’2’’, 230-pound junior turned out to be one of the hidden gems of college football’s most talent-stocked conference. In 11 games of action, he threw for over 1,900 yards, ran for over 800 yards and accounted for 23 total touchdowns. Not only does Prescott wear the same No. 15 as Mullen’s former pupil Tebow did at Florida, he also shares a similar type of compact, powerfully-built frame as the former Heisman winner, which allows him to lower his shoulder and take on tacklers without hesitation. Not only does he have the power and the fearlessness to run over defenders, he’s also got the speed to run right by them, as he displayed on runs like this 47-yard sprint against Auburn last year. With a big, strong build, an impressive set of wheels, and enough arm strength to create big plays in the passing game on a routine basis, Prescott certainly looks like the complete package. The big question is: Does he have what it takes to be the true bona fide leader that helps elevate the Bulldogs to the next level in the SEC? Reports coming out of spring practice were resoundingly positive and they only helped to strengthen the optimism surrounding the budding star signal-caller. In an article published by ESPN’s Edward Aschoff, center Dillon Day praised his quarterback’s offseason work ethic. It’s that type of drive and determination that separates the gifted players who simply coast on their physical gifts from the premier players who separate themselves from the pack and prove to be the true cream of the crop. Prescott clearly has the physical tools to become an elite quarterback. It’s up to him to seize the chance and make the most of his ability. In this day and age, college football has become a sport where we see a host of new breakout star quarterbacks on a yearly basis. Just look at the last four Heisman winners: Jameis Winston, Johnny Manziel, Robert Griffin III and Cam Newton. After displaying plenty of glimpses of his potential during his debut campaign, Prescott’s name belongs on the short list of candidates to become one of college football’s next breakout star quarterbacks in 2014. Following the departures of big-name starting quarterbacks such as Johnny Manziel, Aaron Murray and AJ McCarron, the SEC is a league that now lacks a definitively great quarterback. The opening is there for a new star to rise this fall. With 18 returning starters, including All-Conference-caliber impact players like WR Jameon Lewis, LB Benardrick McKinney and DL Chris Jones, this is shaping up to be the best squad Mullen has had at Mississippi State. It also helps that some of the top teams in the normally brutal SEC West division like Alabama, LSU and Texas A&M have each lost a significant amount of NFL talent, and all three will be breaking in new starting quarterbacks this year. The window is open for Mississippi State to make a significant move up the ladder, and it’s not out of the realm of possibilities that the Bulldogs could even make a similarly surprising run like Auburn and Missouri did in 2013. Obviously, the real key to success is Prescott. The former 3-star recruit from Haughton, Louisiana seems to possess that “it” factor that you only tend to see in special signal-callers. He’s got the arm, he’s got the athleticism, he’s got the intangibles, he’s got the work ethic and he’s got the natural playmaking instincts to emerge as Mullen’s next great quarterback product. There appears to be plenty of critical elements—right time, right system and right surrounding pieces—that are converging to make 2014 a potential breakthrough season for Prescott. SEC defenses better beware of the “Dak Attack” this fall.